The Sydney Fringe 2010 presents Stories from the 428 at Sidetrack Theatre, Addison Rd Marrickville. Sydney at the moment is awash with theatrical activity. The Sydney Fringe has curated a robust and busting program of performances around the city. There is too much to see alongside the regular ‘stuff’ and the responsibilities of just making a living. However, yesterday having a Book Club Meeting at the Addison Street Sunday Markets was a treat for us all, and I noticed that Stories from the 428 had a 2pm matinee and I could manage it between a film date at The Randwick Ritz – THE DISAPPEARANCE OF ALICE CREED - worth catching, especially if you have aspirations to be a film maker. Stories from the 428 is a collection of small anecdotal observations in short play/sketch form, that have been curated from an original commission and season earlier in the year. Augusta Supple was the engineering spirit about the original and now this resultant presentation. 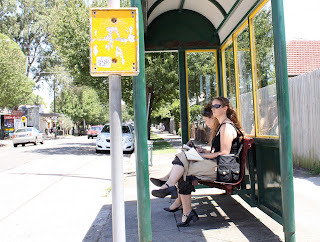 A collection of writers rode the 428 bus from Circular Quay to Marrickville/Canterbury in February, and then “within 24 hours they had written scenes, stories, lists and even a song reflecting their experience on the bus”. Ms Supple goes on to say, “Playwrights are our historians, notating and reflecting on who we are here and now. Stories from 428 is a love letter (sometimes tender, sometimes exercising tough love, sometimes awkwardly hilarious) celebrating the bus route and the people who travel on it, our neighbours, our community”. Ten writers, six directors, fourteen actors (on my afternoon), and technical crew of seven have collaborated for this performance – a veritable miracle of organisation, to say the least. Most of the writing is warm and reflects, it seems, the experience of public transport on this route, for there were many responses of familiar identification from the audience- laughter and wishful willing of ‘soap-opera romances’ to resolve gorgeously. The short plays/sketches are mostly ’cute’ and given the form, I guess, not very challenging: depth of writing or subject matter. Most of the experiences of the matinee were affirming and relatively superficial observations. We left the theatre as we entered it, relaxed and comfortable. Not much meat, lots and lots of gravy. The few pieces that seemed to have “meat”: Bethlehem (Kit Brookman) – a serious rumination on the peculiar city-sisterhood relationship and differences between Marrickville and Bethlehem, and the anarchic sketch of a human bomb on the bus, NO RIDES LEFT (Jasper Marlow), that book end the spoken texts, lost impact with low voltage performance or misguided direction choices. In fact it was in the acting and direction that one felt there was a lack of real care or skill or time in the embodying of the writing. A pleasant time filler and “…so parochial” as I heard one audience member declare, as he left. I remember reading the anarchic pleasure and technique that Joe Orton (ENTERTAINING MR. SLOANE, LOOT, WHAT THE BUTLER SAW etc) used to take in witnessing conversations on the local London bus routes and re-organising them into trenchant dialogue for his revolutionary output. How one longed for some of that writer’s world view and courage, even re-organising wit, in this afternoon, to balance the ‘Aunt Edna ‘ feel of most of the writing. Opportunities missed or just a reflection of the comfortable lives of these young people, writers? In fact, after the performance, I caught the 3.43pm 428 Circular Quay back to the city and witnessed a great argument between two sets of passengers just as the bus reached Enmore Road. It was still going through King Street to the Broadway stop - on and off. One set, middle aged, seemingly in response to the other set, elderly women, about the need for human compassion in the world - it became quite thrillingly heated and public. Life, then, was more challenging than this Art. If only the art at Sidetrack Theatre reflected some of the passion of this vignette of life on the 428 bus! My experience of this piece was that the writing is shallow and the acting and directing components were very shabby - so often the case with the well-meaning grass roots ventures. The industry needs not only to recognize that developing new writing requires time but start allowing this to occur- especially with new or emerging writers. The 428 is a good example of this issue. The work needed more time so that the people involved could get to the heart of what they wanted to say , or indeed realise that there was nothing to say which wasn't said already by simply catching the existing bus ride. Like many of these well meaning projects, often run by the same well meaning people they ultimately result outcomes that work against the industry building audiences. Thanks for the comment. It is not only TIME but also rigorous dramaturgical discussion over that TIME. The USE of the TIME is the critical ingredient. I don’t know how much development happened with the 428 project between the original presentation, earlier in the year, and this September, Sydney Fringe presentation. Was there any input from the Artistic Body of the Production group with writers and directors? Was there discussion and input from the other “creatives” in the remounting period? Was there much proper rehearsal preparation/ time? Probably not much. The organisation of the collection of presentations would have been prohibitive in terms of time, space and budget. What was achieved is riveting in itself and deserves much credit. However….. The history of the writing of Jonathan Gavin’s BANG, which arched over several years, the history of Brink’s production of Andrew Bovell’s WHEN THE RAIN STOPS FALLING and even the project ONCE UNDER A SKY by the Cursing the Sea company now showing at the Newtown Theatre as part of the Sydney Fringe had a lead up time and rigour of years of development. These projects worked better for me. TIME and RIGOUR being key to the outcome, I’m sure. By the way, the audience that I saw 428 with on Sunday was both comfortable in numbers and also well satisfied with the experience, observing the applause at the end of the performance. I don’t believe that the majority of the audience was put off going to the theatre- maybe even to the contrary. So as an Audience builder, 428 was probably an asset to the industry .In fact even though I personally admired the potential of the writing of ONCE UNDER A SKY more than most of the writing in 428, the crowd pleaser would possibly be the latter rather than the former. Horses for courses.